By using our website and online store, you are bound be our terms and conditions, including store terms and conditions at checkout. Please read this information carefully to avoid disappointment. Parcels sent to New Zealand must have the correct postage applied at checkout. While our store will update your city location - we offer several selections which include express postage and postage insurance for parcels posted within Australia, for this reason you will need to CHOOSE your shipping option from 4 different shipping methods. We cannot ship lamps outside of Australia. We take great pride in knowing that your order reaches you in good speed. Every order placed before 3pm Monday through Friday will be posted the same day! That's kind of awesome compared to some other online stores, waiting for up to 2 days before shipping products to you. In certain cases where it's unavoidable, Orders may take a 48 hour processing period. Your gel polish parcel will be delivered to your letterbox, or sometimes due to the size of larger parcels the postman may leave you a card to collect the items from the post office. We usually always post out orders on time, so please contact us if your order has not arrived after 5 business days. Signature on delivery option can be selected for extra peace of mind. We ask that you include your mobile phone number at checkout to avoid delay! On occasions we may substitute Óut of Stock Gel Polish Colours with similar replacement colour. 'Usually' these colours will be a close match. - 1: you have provided a phone number on your order. - 2: We do not have time to get an email response from you and we are ready to ship the items. We will not hold up an order that is to be shipped via express post whilst we try to make contact with you - unless certain circumstances deem it unavoidable. If you would like a certain substitute colour you must make a note where we ask you to leave the comments on the order page and we will refund your colours instead. Lamps may be posted from our partner warehouse location in Sydney, Queensland or Melbourne depending on the quantity of lamps ordered. If express post has been paid for and the item is to be shipped from Sydney, there will be a 48 hour processing time, please contact us if uncertain. We usually post all orders on time, so please contact us if your order has not arrived after 5 - 7 business days. A tracking number will be emailed to you with the details of your parcel. We process, package and post your order for what it cost to ship and in some cases less. We generally never charge you for handling fees. Orders received over the weekend are posted on Monday. On rare occasions we may not be able to ship Bluesky Gel products until the next day, and there may be a 24 hours processing time - and in rare cases we will ship within 48 hours. We ask that you include your mobile phone number at checkout. Please Note: Due to a number of fraudulent charge-backs by paypal, all orders over $150 will be required to have a phone number. Also for all paypal payments please note, we will only send parcels to the name and address on your paypal account, unless you contact us and we agree beforehand: You will need to change the shipping address when you checkout on the paypal website. Our Paypal email address is - sales@blueskygel.com.au and the name will appear as Daniel! If we send you the wrong colours (this can happen occasionally) then you will see the numbers on the bottles are incorrect - Under no circumstances should you open the bottle to look at the color inside. Once the bottle has been opened, we will not complete the return process and you will be required to pay for those bottles before we can send you the correct colours. If you believe you have received the wrong colours, please contact us immediately and we will arrange a return. We will send you a pre-paid shipping label via email so than you can return the products to us.as quickly as possible. As soon as you have posted the parcel, we will see the tracking number has been activated and we can send you the correct colours the same day. When we work together, the return process will happen quickly. Under the Australian health laws, we cannot accept returns of Bluesky Gel Nail Polish. Talk to us i=about faulty items, we are here to help. If you feel you have not receive the correct products, or there is a problem with your order - You must take a picture of the package and it's contents, ás' they arrived to you. We will not offer any replacement unless we have photo evidence. Please chose carefully, there are no refunds given for gel polish! In the unlikely event your items are damaged, photo evidence will be required before we can send a replacement. Please contact us -do not return the package without contacting us first. We cannot send any replacements whilst items are still under investigation. Email & Bank Transfer orders can take up to 48 hours to process. PLEASE NOTE We are not able to take responsibility for the parcels once they are handed over to Australia Post, please consider this when making any purchase. Our standard parcel service covers all of Australia, delivering your item within 1-7 business days or more. 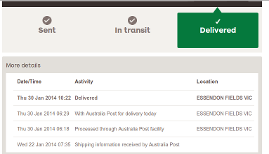 For an estimated delivery time, please see the Australia post website. The Express Post network covers 80% of Australian business addresses, private addresses and post office boxes. If your item is for an address outside this network, we'll use the fastest possible transport links, but it won't be covered by our Next Day Guarantee. Bluesky is as good, if not better and lasts longer than many Gel Polish brands on the market today and produces over 1000 colours in it's entire range ! We currently stock over 300 Bluesky colours such as temperature colour changing gel, sunlight changing gels, glow in the dark nail gel, neon gel, glitter gel, pastel gel, french nail colour gel, and much more. Bluesky is an affordable alternative to some of the more expensive brands on the market today. We recommend you give it a try and hope you love it as much a we do! Bluesky Gel nail polish is free from Formaldehyde, Mercury and Led which makes it more environmentally friendly and safer than regular nail polish. Bluesky is manufactured in strict conditions and already meets British, Asian and European safety standards. We may update our terms and conditions and other information from time to time, it is important that you read these terms and conditions every time you place each order with the Bluesky Gel online store. Any promotions and coupon codes are valid only to you the customer and are not transferable. We may terminate, pause, or change any coupon offer for any period of time at our discretion. When we change or cease the promotion, you will have 7 days to use the existing coupon code before it's expiry. Store coupons for new customers can only be used once per customer and we will not honor any coupon which has been generated from the same customer previously using another email address. Any retail promotions, coupons, codes or any other offer of discount may be 'changed'or 'stopped' at any time without notice. We reserve the right not honer any discount coupon at any given time. Discounts are limited to availability of products/stock and may not be redeemed on any item which is unavailable or out of stock. Bringing DIY Gel nails in your home so you can have Salon Nails, Not, Salon Prices ! We are passionate about delivering quality and affordable products such as UV and Led Curing lampsand Starter Kits for first time users. Bluesky Gel Polish has much longer wear on your finger nails than other brand names and for just a fraction of the cost.